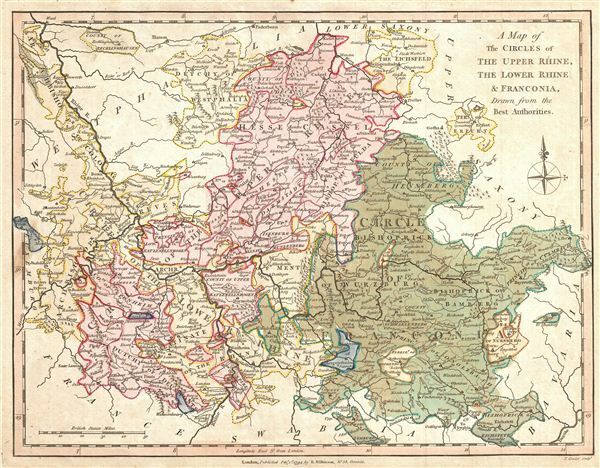 A Map of the Circles of The Upper Rhine, The Lower Rhine, & Franconia, Drawn from the Best Authorities. A finely detailed first edition 1794 map of the Upper and Lower Rhine and Franconia regions of Germany, by Robert Wilkinson, on the eve of the Napoleonic invasion. The map covers the regions bordered by Westphalia and Lower Saxony to the north, Upper Saxony to the northeast, Bavaria to the southeast, Swabia to the south, France to the southwest, and Luxembourg to the west. The 'circles' of Germany are the 'imperial circles,' administrative units created for tax and defense purposes by the Holy Roman empire, of which these areas were a part. engraved by Thomas Conder for the 1794 first edition of Robert Wilkinson's General Atlas.